Is your Child ready for preschool? 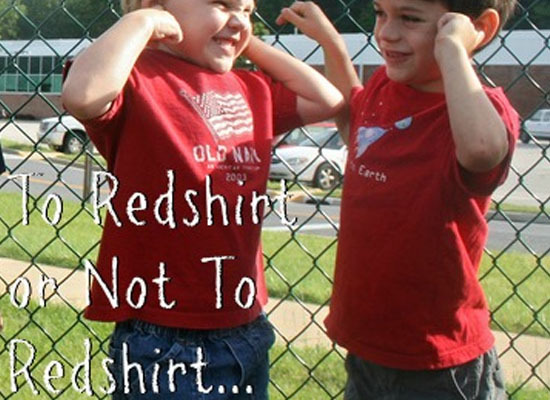 An article on Red Shirting! As a parent of a young child, the start of school is always on your mind. You probably started thinking about it years before your child hit pre-kindergarten age – like in utero. The first big decision is deciding what age you want your child to be when they start school. This is especially tough when your child is born in September or August and is age-eligible to start, but would be the youngest if they did. It is this dilemma the resulted in the concept of ‘redshirting’ a child. Originally coined for sports players needing an extra year of training before starting in the pro-leagues, “Redshirting” is now popularly used to refer to purposefully keeping your age-eligible child from starting school in order to let them mature and prevent them from being the youngest in their class. Having a later summer birthday never felt like a bad thing when your child was a baby. It meant pool parties, back yard BBQ’s, and family get-togethers. But now you’re faced with starting school. You’ve heard the buzz about ‘redshirting’ and are wondering if your September or August child should wait an extra year before starting school. You obviously want them to have the best chance at success and are feeling anxious not knowing what to do. Why wait? There’s no clear-cut evidence that’s 100 percent proof-positive saying that your September or August born child should wait an extra year to start school. While it might seem logical that an older child will do better academically, physically and socially, the research to back-up long-term gains isn’t really there. What does that mean though? Although ‘redshirting’ has become popular with parents, let’s investigate what science (or educational psychology) tells us? While the research into the subject is starting to shed some light into the issue, it’s not conclusive in every case. There is some research saying that some children benefit from waiting one more year to begin school, but that academic advantage isn’t sustained through the child’s entire academic career. Often, by the time that child gets to middle school they aren’t much farther ahead than a child who started school a full year younger. Some studies into the who’s and why’s of redshirting have found that children who start school later, tend to come from higher socioeconomic classes. These children also tend to be white and male. This may have something to do with the pressure that these families put on children to succeed scholastically, and the fear that a ‘spirited’ or ‘high-energy’ boy may not come out on par (or above) with other children academically. Call it the race to Harvard or blame it on high-stakes testing and the growing trend towards academic accountability – either way, parents feel the pressure to ‘help’ their children not just succeed, but rise to the top of their class. If you decide to hold your child back, make sure you have a childcare plan that will last until the next school year. This might mean continuing in the same preschool program that your child is already in, enrolling in a transition class (a class that’s specifically for children who are in between preschool and kindergarten) or finding private childcare at home. If staying home with your child is an option, you can keep your child in the learning loop by adding a few activities/classes such as an art workshop offered by a museum or a class at the local science center. Some parents also choose to homeschool their children during this year. Putting together a school-like day, filled with reading, math, science and other playful learning experiences. Another factor contributing to the trend of ‘redshirting’ is the implied advantage of the idea. It seems obvious that waiting an extra year to start school would lead to a child being smarter, better behaved and more physically adept. If one child turned five in August and another child turned five in September – of last year- who do you think will excel in kindergarten? The older one most likely. As logical as it might feel to hold your child back, know that it does not necessarily mean they will be better off. Every child is unique. Your August birthday baby may have the physical skills of a child who was born six months prior. While there are generally accepted norms for developmental milestones, your child is still an individual. Holding off on kindergarten for an extra year doesn’t guarantee that your little learner will blast past their classmates in academic areas, score higher on tests or rule the school in every sport. But, it also doesn’t mean that your child won’t. I know that seems counterintuitive, but children are unique dynamic individuals who constantly surprise us with how quickly they learn new things. We can’t force them into an age box and tell them what they can and can’t learn simply due to their age. Like everything else that comes with being a parent, choosing when to start your child in school isn’t easy. There’s no manual for raising the perfect child and you won’t find that the ‘experts’ all agree. It comes down to knowing your child. If you have a child who is socially adept, manages their behavior at an age-appropriate level, can play well with their peers and is eager to be challenged, then you should absolutely send them to school. If your child is timid, tends to get overwhelmed in crowds, has a hard time playing in groups, and needs constant reassurance, they are the kind of child who would benefit from that extra year of development in the security of their home and familiar supportive role models. Without a clear answer, parents are often left confused and must rely on educators to guide them. So, gather as much information as you can, get some expert input and do what feels right – to you and your child!